Can’t afford a pricey nose job? Wish you had nose lift without surgery? NoseSecret® is the one product you need. Easy to use and maintain, NoseSecret® ensures safe nose tip reshaping without surgery. Its convenience, simplicity and quality have made it widely popular for those seeking immediate nose reshaping results. NoseSecret® consists of a pair of curved and comfortable splints that you place at the inside edge of each nostril to make your nose look narrower and straighter, instantly. It's anatomic form and flexible material allow for easy adjustment between the tip and the base of the nose without discomfort. By creating this gentle pressure, the nose reshaping splint holds by itself, gently lifting the tip of the nose while narrowing the nostrils. The result is a more refined appearance of the nose and ultimately a better harmony of the facial features. Be sure to follow all nose splint placement and removal instructions. WHO CAN BENEFIT FROM NOSESECRET? 2. Refine a bulky nose tip. In order to avoid the hassle of choosing the wrong size, we offer first time buyers the choice from three introductory kits, each kit comes with three pairs of NoseSecret® nose corrector - one of each size. Choose Kit XS,S,M if your nose is very small to a medium size. Most Asian noses. WHEN CAN I USE NOSESECRET®? Since NoseSecret® is easy to insert and remove, with some practice it will take around 20 seconds to complete both tasks. One can use it whenever they want, except when swimming, laying down, sleeping, working out, or performing any strenuous activity. 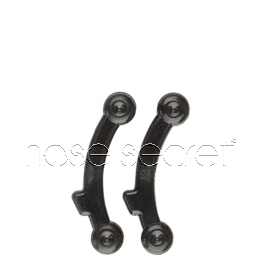 NoseSecret® is unnoticeable; it is an ideal cosmetic solution for photo shoots and special occasions. However, more people are starting to wear NoseSecret on a daily basis. WHY NOSESECRET® OVER OTHER NON-SURGICAL NOSE PRODUCTS? NoseSecret® is a worldwide trusted brand in non surgical nose job alternative for almost 10 years. Mentioned in in mayor TV networks in the US and abroad such as NBC Good Morning America, E-News network -Botched blog, Buzzfeed, Bobbie Buzz, Beauty guru Michelle Phan, among others, NoseSecret® is 100% made in the USA. * Quality product built to last. * No down-time from work. * Satisfaction guaranteed or your money back. NoseSecret® is sold throughout our online nose reshaper store NoseSecret.com. We are proud to say that Nosesecret is 100% made in the USA with customer support via phone, chat, and email. We also sell on our EBAY store NoseSecret® . WE DO NOT sell NoseSecret in Amazon. Any product listed under our brand name in Amazon is fake. Any display of our Trademark in Amazon is a violation of the US trademark laws. For more information, read our Frequently Asked Questions FAQ. Contact us if you would like learn more about our product and someone will help you with your purchase.